the objects on the picture. She adds them mostly correctly by counting total number, and she is always correct in identifying which player has more. An interesting point during the game happened when we both drew a nine. Hers was 7+2 and mine was 6+3. Smarty said, Oh, that’s how we make numbers in different ways! I tried to explain this concept in various ways in the last two weeks, but somehow it really clicked during this game. I tried to introduce the idea of “counting on” the objects instead of always starting from 1, but this is something that she doesn’t understand yet. At least she loves “counting games”, and this is what really matters. Counting on is very difficult for some kids. When I taught 1st grade it still was a struggle for some. Don't you love when the lightbulb goes on? Isn't it funny what finally makes something click? 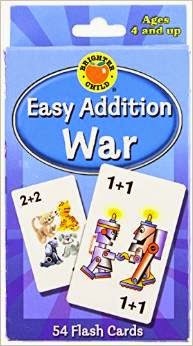 I should try playing war with my kids sometime, I'm sure it would be popular. 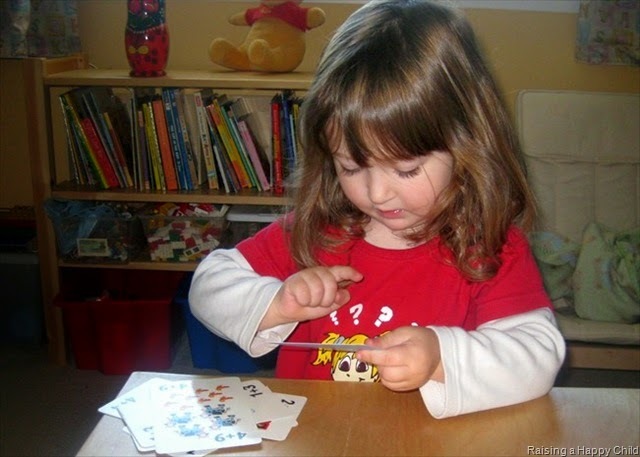 My kids love counting and adding games. It's fun to see them understand numbers like that. This is great! Way to go Anna. Games usually always help to get the concept across. Games are the best way to teach! We've played war and it's one of our favorite games. Right now, we're working on building visual sense so she doesn't have to count every single time she sees a pattern of dots. We're also working on one more and one less which I hope will build a foundation for counting on. I want to make a button for cool math activities. Any tips on designing a button? Did you use photoshop to design yours? I would love to link up all our math activities and hope to get people to do more math at home! If she understands that conceptually, she'll really enjoy Math Fables. That is really what the book is about - different combinations to make the same number. Go, Anna, Go! We really like the Base Ten Blocks as an adding manipulative. Once their ready for place value, it really solidifies the combos to make ten. Anna looks like she is having a lot of fun!